Tack/equipment listings on DressageMarket.com are for advertising your tack/equipment only. These listings are not meant for advertising multiple items or to provide a link toward your sales, breeding or training facility. 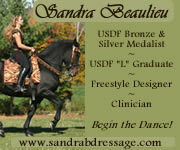 DressageMarket.com invites you to list your dressage-related business in our Directory.